Pot roast has to be one of the easiest, nutritious and tastiest one-pot dinners possible. You turn an inexpensive piece of beef and vegetables into a sumptuous meal that is good for most metabolic types. It’s easy to manage your salt content when you control the salt shaker. This style of cooking is called braising, which tenderizes the beef by slow cooking in a simmering liquid until it can be cut with a fork. You can use root vegetables other than the listed potatoes in a pot roast, if your diet requires a lower glycemic index carbohydrate. Meats, herbs and other ingredients are easy to exchange if you wish to experiment. This booking style is also the basis for beef stew. Stew meat is typically tougher with less fat than a chuck roast, and stew meat is cut into cubes instead of using a one-piece roast or thick steak roast. 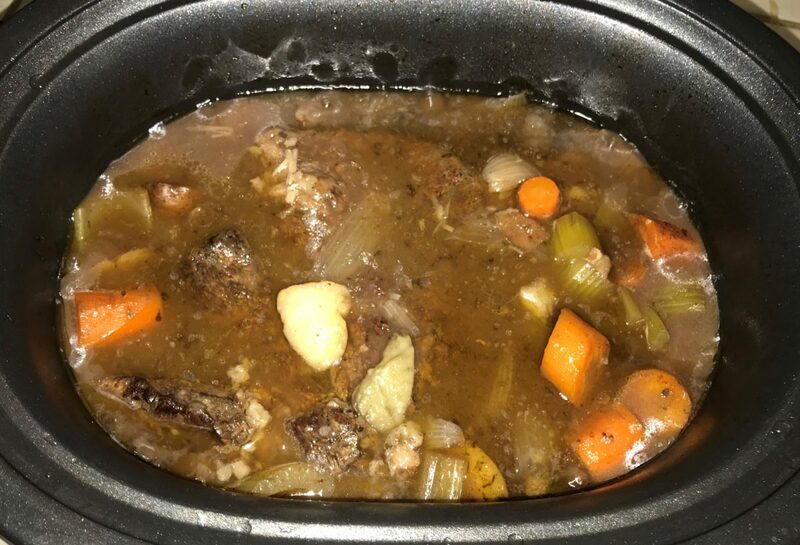 Beef stew is a little easier to portion and freeze than pot roast, but you can portion and freeze either one if you want to fill your freezer with ready-to-eat meals. 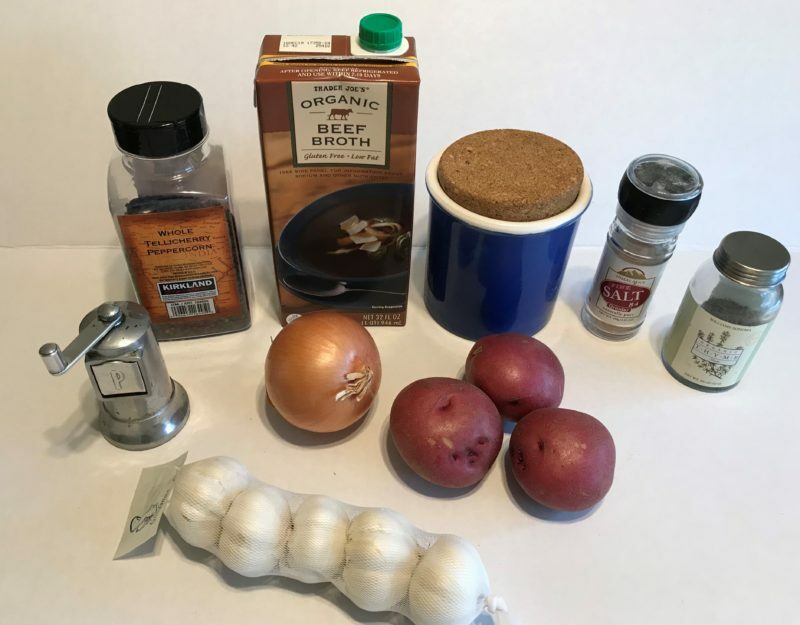 Pot Roast takes about 15-20 minutes of preparation, and 5-8 hours to cook depending on cooking temperature and pounds of meat used. 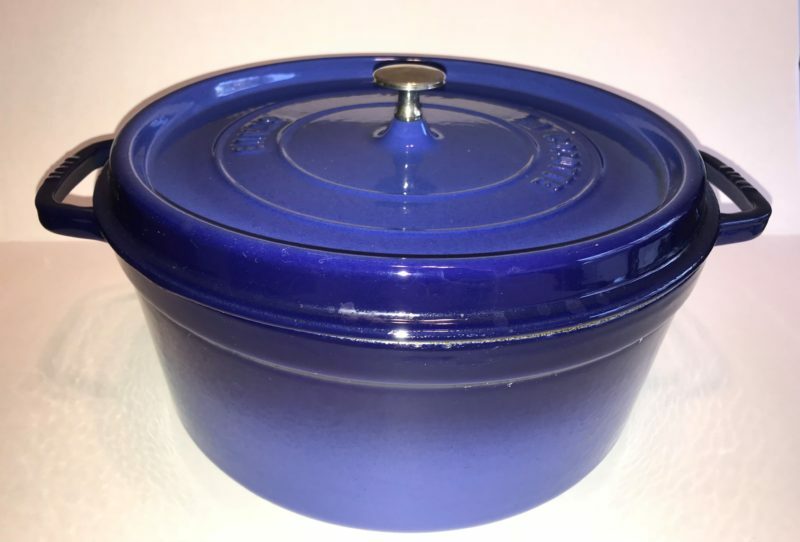 You can cook it in the oven or on the stove top in a dutch oven, on the stove top in a heavy 6 quart stock pot or in a counter-top slow cooker. 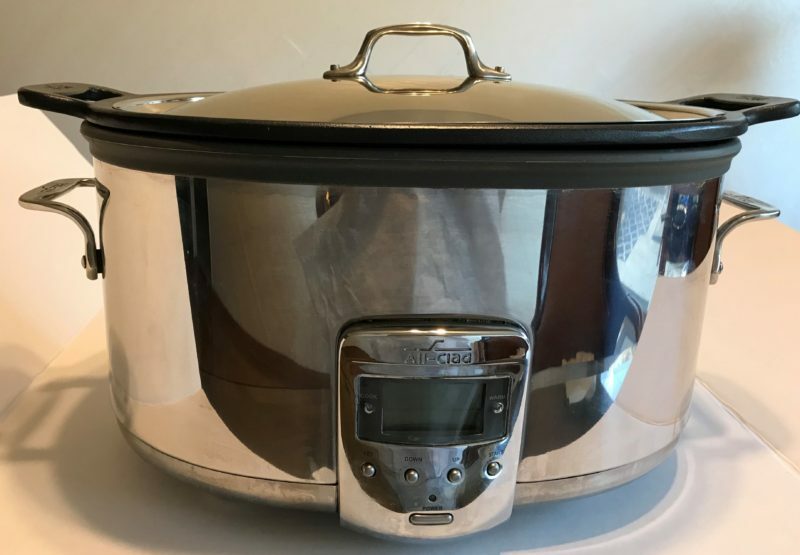 Last night, I used our slow cooker and it was ready in 5.5 hours on high for a 3.9 lb. chuck roast steak (~2.5 in. thick). The featured picture above is the pot roast and vegetables in the slow cooker. I often make my own stocks from scratch, but I used a store-bought Organic Beef Broth last night. Fresh stock done right is awesome, and homemade allows one to control ingredients like salt which are often added to processed foods. The Trader Joe’s Brand that I used still added nearly 1200 mg of sodium to the pot or 150 mg per serving which is not too bad compared to some. “Better than Bouillon” beef broth paste diluted in water is a flavorful substitute to store bought beef broth. I am not fan of beef broth cubes as they tend to be packed with salt, but they add flavor over just using water. I used a cup of inexpensive dry Italian red wine last night, a Montepulciano d’Abruzzo, but you can use an inexpensive Zinfandel, Cabernet Sauvignon, Merlot or other dry red table wine. Use a dry wine and don’t worry, the wine just adds flavor and the alcohol boils off. If you’re not quite of drinking age yet, well the wine is optional. One of the most important parts of getting great flavor out of the beef is “browning” the meat (giving it a brown, dark-spotted crust) before braising. It only takes about 7 minutes to brown all sides of the roast with a tablespoon of oil over medium-high heat. I prefer to brown my meat in the same cooking pot to retain all the flavors from the browning step. 1. Use a paper towel to blot your roast to remove fluid from the meat’s surface before seasoning and browning. 2. Use 2 teaspoons of Kosher, Sea or Himalayan Pink Salt and 1 teaspoon of ground Black Pepper sprinkled on both sides of the roast before searing. This will make a delightful browned crust as the basis for your pot roast. 3. One of our slow cookers has a removable insert where we can brown the roast on the stove top. Of course, you brown your meat directly in a dutch oven or stock pot if you go that route. For one pot cooking, I throw my onions in with browning meat to soften and carmelize after I turn over the roast to brown the second side. Note: If you must brown your meat in another pan because your slow cooker doesn’t have a insert, don’t worry. After browning in the heavy frying pan, throw your wedge-cut onions into the pan for a couple minutes to soften and sweeten after browning the roast. Use a wooden spoon and carefully add some beef broth to scrap off the browned bits left in your still hot frying pan. These scraped up bits go into the pot to bring out the flavor. 4. Cut the red potatoes into ~1-2 inch chunks (cut in half lengthwise, the half cut in half lengthwise and cut in half crosswise). 5. Cut the celery and carrots are cut into ~2 inch sections and get dumped into the pot with the potatoes. Depending on the shape of your beef roast, you may need to put the roast partially on top of the vegetables with the rest surrounding the meat. 6. Smash or mince 2 large cloves (segments) of garlic, although one can use more smaller cloves to get the same amount of garlic. Some say to mince the garlic, but you can crush the garlic clove by pressing the side of your cooking knife onto the clove with your hand to smash it. Remove the papery cover from the clove and drop the cloves into the pot. Told you this was easy. 7. Now you need some thyme. Dried or fresh is fine, but about 1 teaspoon. Add the Bay Leaf too. Here comes the hard part. You need to open the bottle of wine. My dry Italian red wine didn’t have a screw top, so corkscrew or waiter’s bottle opener to the rescue. Once open, smell the wine to make sure that it’s not corked. 8. Pour a cup of wine (~1/3 of the bottle) into the slow cooker/pot, but a little more won’t hurt. 9. Add about 2 cups of the beef broth to the slow cooker/pot. You want the beef broth/wine level to just cover the roast. A little bit of the meat floating above the liquid is fine, as the veggies and meat cook down during the braise. 10. Put the lid of the pot, dutch oven or slow cooker on the pot. 12. I like to add a thickening agent such as ~2 tablespoon of Flour, Arrowroot or Cornstarch mixed in 2 tbsp. of water to make a paste to the pot. This gives the braising liquid a finished gravy-like thickness when serving. Note: Flour can be added at the beginning of the cook for walk-away ease, while it’s best to add the Arrowroot or Cornstarch about 1 hour before the roast is ready. Do not overcook or overheat Arrowroot. I love to cook with Extra Virgin olive oil (EVOO) for the flavor, but you have to watch the oil temperature as you will oxidize the oil (turns bitter) over ~374° F. More expensive, low acid, high-quality EVOO or Virgin Olive oils oxidize between 405-410° F, so you have a little more room for error. Canola oil smokes at 400° F temperature, so it offers a little more room for error as well. Safflower oil smokes at 450° F. Just watch your pan/pot temperature. Don’t let the steam burn you when you add the broth. 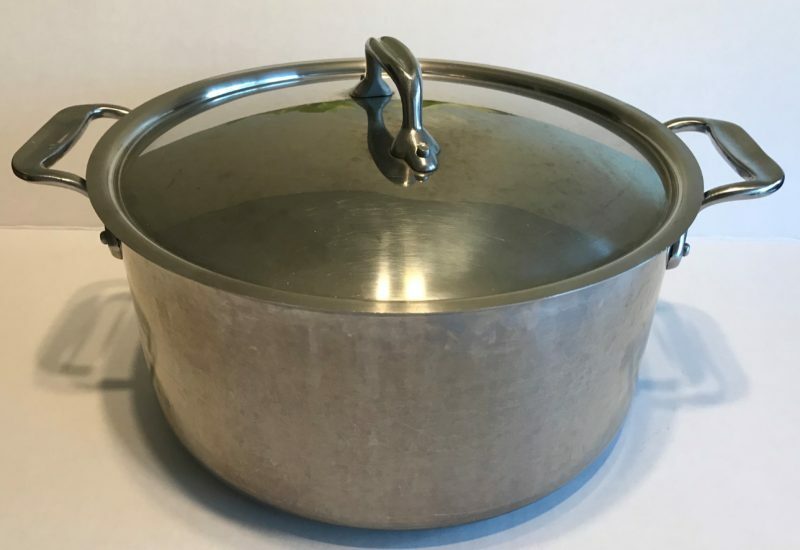 If you are new to cooking, a chef’s secret is to use your mouth to blow the steam away from your hands when adding liquid or draining liquid from a pot or pan. Red potatoes don’t turn mushy as quickly as Russet potatoes with braising. Yukon gold potatoes have a nice flavor and good texture as well. If you use Russet potatoes, it will turn out just fine but the cubes tend to fall apart. I recently learned that fingerling potatoes may have a lower glycemic index than their larger potato counterparts. I will experiment and post an update. If you try fingerling potatoes, let me know how they work out. If braising on the stove top, set temperature to medium-low heat (~180° F), so the mixture simmers without burning or boiling over. The stove top version should take about 5-6 hours to become fork tender. If you use the dutch oven and cook in the oven, you’ll want to cook at ~300° F until the meat cuts with a fork (~4 hours). Braising should be done at lower temperatures and too high of an oven temperature can leave the tough and dried out. Sliced brown or white mushrooms add flavor and additional nutrients to pot roasts and stews. A teaspoon of fresh or dried Rosemary is another terrific herb to change up the pot roast or stew flavor profile.